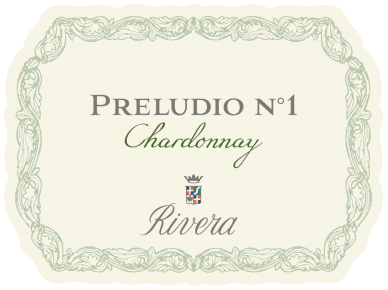 Preludio N.1 testifies to the successful introduction of the chardonnay grape to the Mediterranean climate of the Murgia hills of the Castel del Monte DOC area. Here, the cool north wind ripens the grapes slower than in the torrid southern section of Puglia, giving Rivera’s wines an added measure of acidity and subtracting a degree or two of alcohol. Chardonnay Preludio N.1 was first produced in 1985 and it was the first commercial Chardonnay made in Puglia. Located on the highest hills at an altitude of 350 meters on rocky soils, the vines are trained to the spurred cordon system at 4,800 vines per hectare. Yield is kept as low as 90-100 quintals per hectare. The grapes are harvested in mid-August and fermented at controlled temperatures. Unoaked. The contact with the lees for a few months in cement tanks allows to obtain a wine with pronounced personality, typical of the variety, and a great balance between complexity and freshness that goes well with seafood dishes, shrimp risotto, poultry and veal. – 2016 rated 90 WE ‘Editors’s Choice’ - top scoring Chardonnay! – 2017 – Starting with the 2017 Preludio Chardonnay will feature Stelvin closure and a lighter colored bottle. Spurred cordon system t 4,800 vines per hectare. Yield is kept as low as 90-100 quintals per hectare. Fermentation in stainless steel 9-10 days at 18°C. 3-4 months in glass-lined cement vats on the lees.